Fire? An accident? With the Rescue Set of Clicformers, help is already on your way! The sirens are glowing red when the ambulance, ladder truck or tanker arrives. You think this isn’t enough to control the disaster or fire? No worry, because with this Clicformers Rescue Set you can also build a command fire brigade command truck or a rescue truck or bus. Everything you need to quickly get the situation under control. Well…, that and keeping the head cool of course! This Clicformers set is an educational and creative toy. Educational because this construction toy stimulates and supports the cognitive and motor development of children. 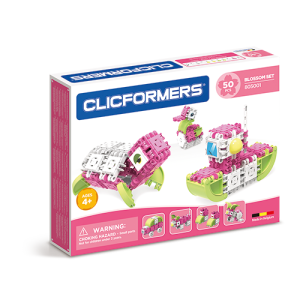 Creative because the Clicformers construction toys appeals to the imagination and invites children to role play. With Clicformers, children build their own story. And in the case of this Rescue Set, they learn that a good preparation is half the job for a successful rescue operation! Combine different Clicformers sets for even more fun.